The development of gas lighting was one of the most important technological improvements of the Victorian period. Early gaslights shot a naked flame through a simple metal tube, in much the same manner as a Bunsen burner. These were prone to go out in the merest draft, however, and used too much oxygen for indoor use. 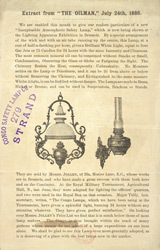 Developers began working on an incandescent mantle to make gas lighting more stable and practical. This involved hanging a cotton-mix fabric above the flame. When the lamp was lit, this cotton burned away and the remaining oxides produced a bright light. Lights such as the one advertised here could burn for 24 hours at the same intensity and without smoke or smell.